Well, we knew Aston Villa were bad, but we weren't expecting them to lose 6-0, were we? Not a very happy Valentine's Day for them. Who is letting down who? Aston Villa boss Remi Garde: "I feel humiliated. I am sorry for the fans who came to Villa Park. Before the game you could expect the two team were not on the same level, but after 15 minutes, I don't know what happens. The first two goals were difficult to digest and my team did not play anymore. "This is a bad feeling that we did not fight enough, it was very easy for Liverpool. The fighting spirit, I was expecting that but we did not deliver it. "I was not expecting this kind of match and we have to go for the next win now. Until we have little hope, we will still believe. After a game like today, it is difficult but we won't play Liverpool every day. "I understand [the fans' frustration] I don't know who let down who in this football club. I am trying to concentrate on my job and working with the players who want to fight." Liverpool boss Jurgen Klopp told Sky Sports: "The whole package was not too bad today. Everything good happened today because Aston Villa were very ambitious before the game but under pressure. We made a brilliant first goal. We had a few more chances and this was very important. It does not happen too much where as a manager can enjoy the last 20 minutes. A very clear result in the end. "It makes a difference having both Philippe Coutinho and Daniel Sturridge are on the pitch, you can only play them when they are fit and available. We want the highest quality on the pitch as much as possible, you saw that today. "We are always clear. When you are injured and out, you need time and when you are back, you are back. It is a situation where you want to play football, it is good Sturridge can do this now. "We have two Europa League games coming up, then the League Cup final. They are big games and we will see who we can bring in. "We broke the opponent after the third or fourth goal. After that they cannot come back into the game." Some strong stuff from Aston Villa boss Remi Garde coming up, including an apology to the fans. "This has been a very very long second half for Villa. "An absolute shambles. The biggest round of applause came from the Villa fans when Christian Benteke came on. I think the fans know that he did more than anyone to keep Villa up in the last few seasons." "The Villa players just aren’t good enough. There was a derisory cheer when Sinclair hit the post. What must the European Cup winners from a proud Aston Villa side think of this? "I don’t blame Remi Garde but after this game it is 15 games and 12 points but he got a hospital pass. "He is not happy at all about the lack of investment. It will take a lot to make him stay on. What is in it for him, after doing so much in Ligue 1?" Liverpool midfielder James Milner: "We needed a win after a few disappointments recently. It was important to do that job and we had a few boys back in training. "We were due a game where everything went for us and we need to build on this. It is a good confidence builder and help us kick on for the rest of the season." Liverpool striker Danniel Sturridge: "It was great to be back but more important that the team won. It was great to get so many goals. "It is great to see Danny Welbeck back and hopefully we will be there in the summer to help the country to success." Wouldn't get too ahead of yourself, Daniel. England boss Roy Hodgson didn't even mention you on Match of the Day last night. That's it. 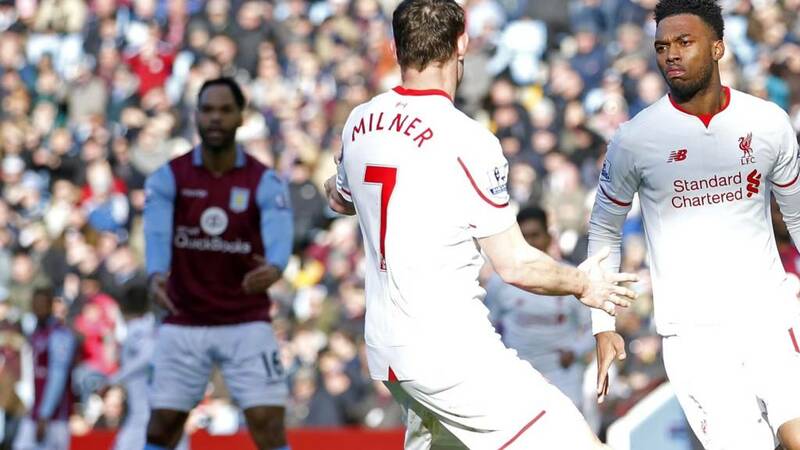 Liverpool haven't even been at their best and have still given Aston Villa a hiding. The Premier League's bottom side look very much a Football League team on this performance. Embarrassing, humiliating, degrading. Whatever you want to call it. Into added time. Three minutes to play. Can Villa hold out? Bonky: I hope the Villa players don't have the brass neck to take this weeks wages for the shame of this battering by Liverpool. Simon Goodall: Not all over yet. Villa might win the second set. A heart-stopping moment as Nathaniel Clyne gives a low cross along the six-yard box but Jores Okore comes across to clear the ball. Best thing he's done all game. Well done. Are Liverpool happy with six? They could easily have had 10. The former Villa manager is on Match of the Day 2 tonight at 22:00 GMT on BBC Two. A penny for his thoughts? I am told Gabby Agbonlahor went off after feeling unwell. The rest of the Aston Villa players will be feeling the same at 6-0 down. They've got eight minutes left to not concede another goal. From the Birmingham Mail's football editor. Ouch. Ooooh, nearly a consolation for Aston Villa and it would have been a beauty. Scott Sinclair plays a one-two with Joleon Lescott, who for some reason is on the edge of the Liverpool box. The winger curls an effort which rattles off the upright and rolls away to safety. Simon Mignolet was beaten all ends up, but he preserves a clean sheet.